Before Jamie Hyneman and Adam Savage starred in their hit Discovery Channel series MythBusters, they worked in special effects on movies like The Matrix Reloaded and The Matrix Revolutions. While their MythBusters episodes often tackle general tropes shown in movies and TV, they also tackle specific franchises and shows, such as Jaws, The Simpsons and Breaking Bad, just to name a few. Last night's episode delved into the Star Wars franchise, and today we have a few clips from the episode. The episode comes at the perfect time for Star Wars fans, following the global release of new Star Wars: The Force Awakens toys and merchandise during Force Friday this weekend. While Saturday's MythBusters episode doesn't specifically tackle anything from Star Wars: The Force Awakens, since there is still little we know about the story, but these clips below will surely be of interest to any Star Wars fan. The first clip can be found on Hero Complex Blog, where Adam Savage revealed that it was somewhat controversial to bust myths from this beloved franchise. "There was internal controversy about testing things from a movie as fantastical as Star Wars. But what we found, what we ended up doing in the episode, were stories we felt we could utilize the world of Star Wars to help the audience understand where a scientific approach can answer genuine questions from a fictional universe." This first clip examines a scene from Star Wars: Episode III - Revenge of the Sith, where Obi-Wan Kenobi (Ewan McGregor) attains the "high ground" in his final battle with Annakin Skywalker (Hayden Christensen). Adam Savage revealed that they did some research into sword fighting to see if having the higher ground provided any tactical advantage. Here's what he had to say below. "There are plenty of military reasons that higher ground is great. But most of them are about being an army. High ground allows you to see your opponent coming. It allows you tremendous advantage in a battle, but Obi-Wan says it as a one-on-one thing. So the first thing we wondered was, 'Does this matter in sword fighting?' So we reached out to some sword fighters, (and these were fencers who used double-edged weapons as medieval reenactors) and none of them had solid reasoning or referred to some tactic where the higher ground is always better. So then we figured if it is such a crushing advantage as Obi-Wan seems to imply then we should compare one against the other, someone on lower ground and someone on higher ground." You can check out the first clip at Hero Complex Blog, and check out three more clips from the Star Wars episode. The scenes feature Jamie Hyneman and Adam Savage breaking down the science of the lightsaber, while exploring whether or not it's possible to actually dodge one of the Stormtroopers' laser blasters. 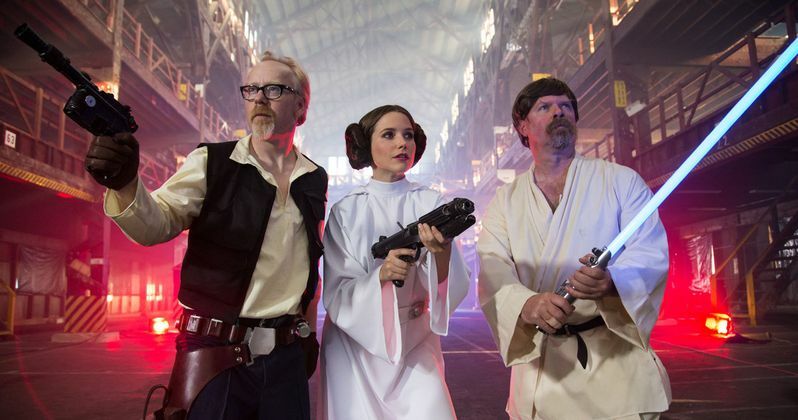 What do you think about MythBusters exploring the Star Wars franchise?